IT has begun testing the distribution of patches through BigFix. Several volunteers including IT staff, faculty, and instructional labs have been patched over the past few months. 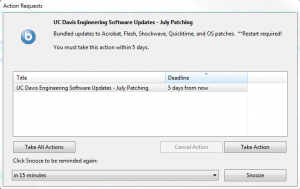 Patching has been fairly noninvasive and provides notices within the tool about what is happening on each workstation. Starting July 1st, patching will be extended to all machines in the College. By default, faculty will be notified prior to any action being executed on their workstations. Instructional lab and administrative workstations will be updated in the evening to reduce disruption to their productivity during business hours. End-users may notice a message similar to this on their computer. 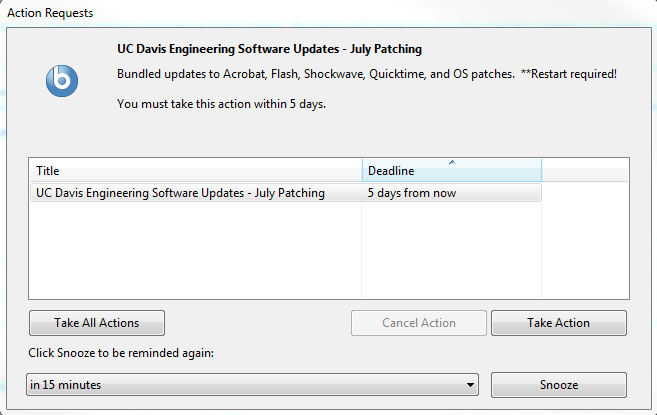 Users have the option to install the updates (Take Action / Take All Actions) or Snooze to a more convenient time.